Supporters of the Orkney man convicted for the murder of a Bangladeshi waiter in 1994 have launched a new website highlighting claims he was wrongly convicted. 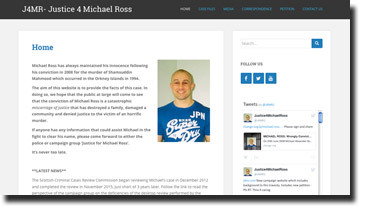 Campaigners have launched the site, j4mr.com, to spotlight the innocence pleas of former soldier Michael Ross, who was found guilty, in 2008, of shooting Shamsuddin Mahmood, in Kirkwall. Justice for Michael Ross says it has carried out an in-depth investigation with the help of well-informed legal insiders and has learned information about police interviews and other key aspects of the murder probe. The campaigners have published details from their investigation on the website, including a claim that police have lost a diary belonging to Mr Mahmood which, they say, was passed to police by one of his friends. Ross’s supporters believe the journal, which is not listed in official paperwork, may hold vital clues to the victim’s death. The murder trial heard claims the killing was motivated by racism on the part of Ross, who was 15 at the time. But the campaigners say they have discovered Mr Mahmood may have known his safety was under threat from someone else because a number of witnesses told police he seemed uneasy and preoccupied in the weeks before he was killed by a masked gunman in a restaurant in Kirkwall. Justice for Michael Ross says its belief that the journal could be a vital piece of evidence was among its concerns about Ross’s conviction detailed in submissions to the Scottish Criminal Cases Review Commission (SCCRC), which investigates possible miscarriages of justice. But the supporters have hit out at the Commission for dismissing the diary as “dead end” in its rejection of Ross’s bid for a new appeal. The campaign group has posted an open letter, criticising that finding and other aspects of the justice watchdogs’ investigation, on the website.